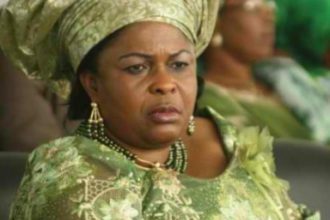 The event was tagged “Let there be light”, Nigeria’s first lady, Dame Patience Jonathan, urged Nigerians to embrace peace, unity and love during the Christmas season. The Christmas Tree, which is 21 metres high, is strategically located at the Unity Fountain Park, besides the Transcorp Hilton Hotel, Abuja and adorned in the national colours of green, white and green. The lighting of the First Nigerian National Christmas Tree by the Wife of the President was witnessed by the Minister of State for FCT, Oloye Olajumoke Akinjide; Catholic Archbishop of Abuja, John Onaiyekan; members of the National Assembly, wives of some Ministers, heads of ministries, departments and agencies of government, heads of secretariats, departments and agencies of the FCT Administration, diplomatic corps and the media, among others. Mrs Jonathan urged Nigerians to live in peace and harmony as she noted that Christmas was a season for peace, reconciliation and love. She also advised Nigerians to support the present Administration to realise its transformational agenda for the nation. She said, “The significance of this ceremony will best be appreciated when we take into account that the Christmas season is a season of peace, goodwill and hope.